At the Landlocked Oyster Fest and Benefit this Sunday, you can try oysters from 19 different farmers, 15 of whom produce in the Southeast. Georgia oyster farmers take up just two slots on that list—most come from the Carolinas, Alabama, and Florida—but that may change very soon. “In the next five to seven years, we want to help increase in-state growers to about 50,” says Tom Bliss, director of the University of Georgia’s Shellfish Research Laboratory in Savannah. 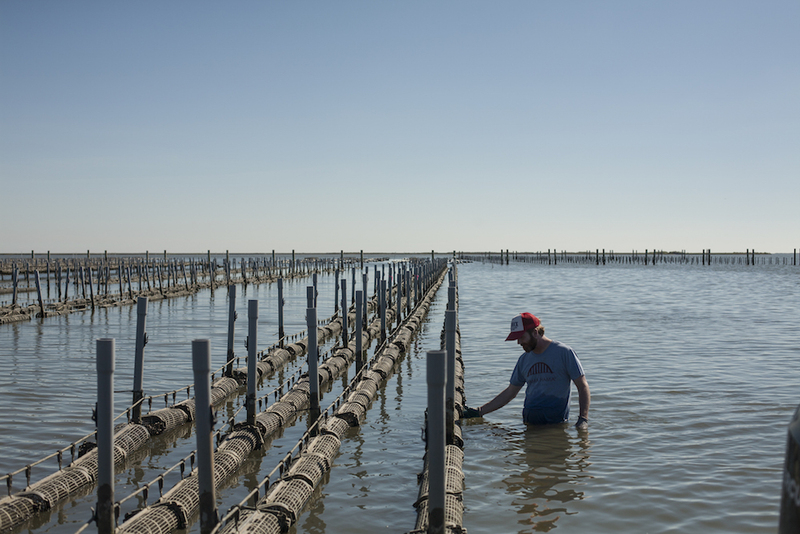 Bryan Rackley inspects an oyster farm in Alabama. 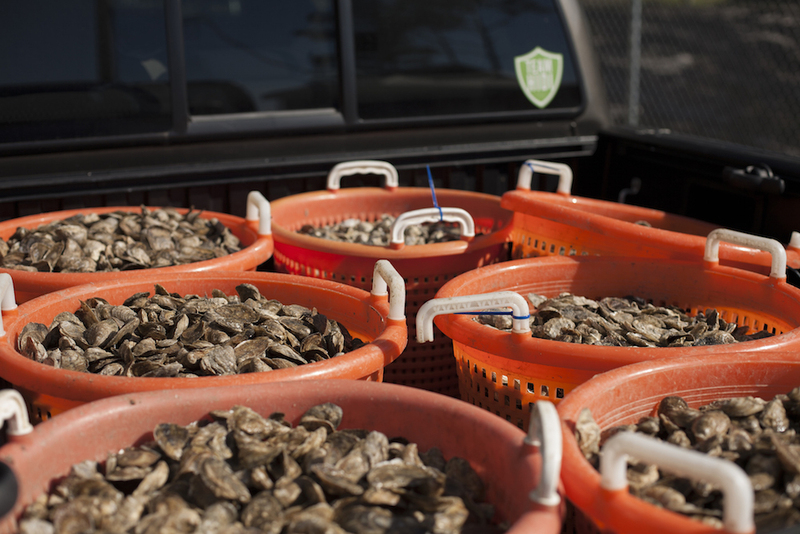 Oyster farming in Portersville Bay, Alabama, has gotten a boon with the help of Auburn University Shellfish Laboratory’s Bill Walton, one of the founders of nonprofit Oyster South. Georgia has a healthy wild oyster population, but because of the large tidal variation here, they grow clustered together. “Our oysters have found their niche in that inner tidal zone, where the predation pressure is lower, but that’s a very limited space,” says Bliss. 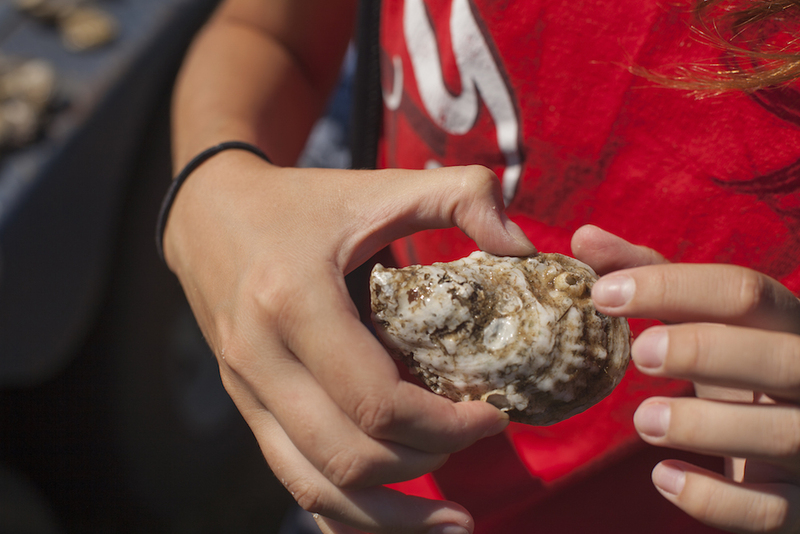 “So when they have their big spawns, all of the spats prefer to settle on existing oysters.” (A spat is an oyster that’s between two and 10 millimeters large. It takes anywhere from 12 to 18 months for it to grow to a marketable size.) Separating those clusters is a labor-intensive process that, because of breakage, ends in a small amount of oysters that could be served the way our tastes have grown to love them: on the half shell. Farming not only gets around that issue, but it also means consistency in count and size, which is what chefs—and ultimately, diners—want. Three years ago the Georgia Department of Natural Resources gave UGA’s lab a grant to help it develop a hatchery, and it’s still the only facility producing spats in-state. So far, it’s been giving farmers spats and teaching them about oyster aquaculture free of charge, but ultimately Bliss wants to attract a commercial hatchery to help supply the industry as it grows. “We can do about five million oysters a year, but commercial hatcheries can produce 50,000 in the same amount of time,” he says. Proceeds from the Oyster South event will help the lab buy larger tanks, improve its filtration system, and add more water storage. “As oyster aquaculture grows, it will lead to more jobs and economic growth in the coastal counties,” says Bliss. Also, existing clam farmers can add oysters to their portfolios, so to speak, and ride out any downs in the market a little smoother. “We have an opportunity to make this a more substantial part of our regional, local culinary identity,” says Rackley. Landlocked takes place from 3 to 7 p.m. Sunday, October 29, at Decatur’s Color Wheel Studios. Tickets range from $100 to $150. For a full list of farmers, chefs, and drinks, go to oystersouth.com/events.